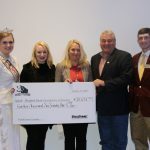 BioZyme Inc., Saint Joseph, Mo., donated more than $14,000 to the Hereford Youth Foundations of America at the recent American Hereford Association Annual Meeting. Pictured from left includes 2017 National Hereford Queen Annah Dobson; Crystal Blin, BioZyme Marketing Programs Manager; Lisa Norton, BioZyme Vice-president; Bruce Everhart, HYFA Vice-president; and Steven Green, NJHA Chair. Hereford producers know that feeding a quality mineral program pays. For the last year, the return has been more than just healthy, growing, productive cattle. BioZyme® Inc., makers of VitaFerm®, and the Hereford Youth Foundation of America have partnered to create the “Feed the Future” program, where BioZyme pledged to contribute $1 to HYFA for every bag or tub of eligible VitaFerm supplement that any American Hereford Association member bought prior to the AHA Annual Meeting. On Oct. 27, Lisa Norton, Vice President of BioZyme, presented HYFA a check for $14,671, and thanked Hereford breeders for stepping up to the plate and turning in their receipts throughout the year. The presentation happened during the AHA Annual Meeting in Kansas City, Mo. Because BioZyme believes so strongly in the future of young people involved in agriculture, they have agreed to continue the Feed the Future program into 2018. Receipts for product purchased and turned in from Nov. 1, 2017 through Oct. 31, 2018 will count toward the 2018 contribution to HYFA. “Feed the Future has the ability to take the Hereford Youth Foundation of America to the next level, and create more opportunities for Hereford youth in terms or education and leadership. BioZyme is such a big part of our past, and now this makes them an integral part of our future,” said Amy Cowan, AHA Director of Youth Activities and Foundation.